Farmhouse with 6 apartments and panoramic swimming pool and large garden is situated in Le Marche a region of central Italy, high in the Apennines on the border with the Umbria region. 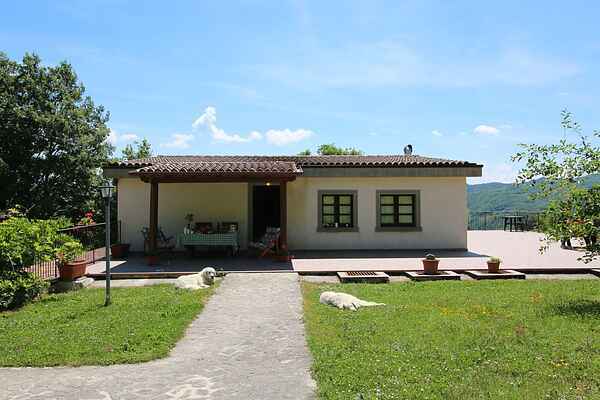 The agriturismo is located on a hill about 700 meters altitude and near the village of Apecchio. The apartments are rustic and cozy. Each apartment has a private terrace where you can relax, dine and enjoy. The area consists of forests, majestic mountains and pure cool air. It is a lovely place to sit back and relax in natural surroundings. In the typical restaurant in the agriturismo you can try truffle dishes and other traditional and regional recipes. It's fun to see how pasta is made fresh in the restaurant. There are two sweet dogs in the agriturismo who like to go trekking. The dogs show the way! There are a couple of pigs, cows and a donkey in the agriturismo. The agriturismo is brewed delicious traditional beer. Organic barley is used which comes from the surrounding fields. Take a look at the brewery.